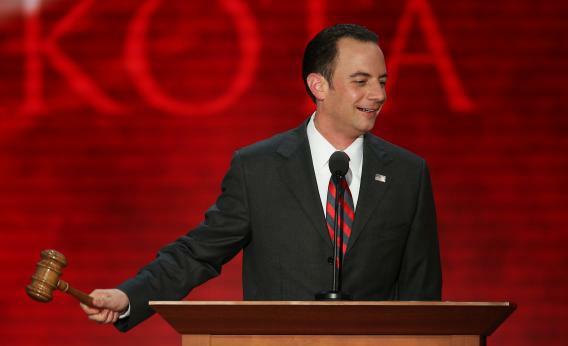 Reince Priebus: GOP's Electoral Vote Split Scheme Would Give More "Local Control"
First, Gov. Scott Walker tacitly endorsed a proposal that would split Wisconsin’s electoral votes by congressional district. Now Wisconsin’s own RNC Chairman, Reince Priebus, is murmuring his approval. “I think it’s something that a lot of states that have been consistently blue that are fully controlled red ought to be looking at,” Priebus said of the plan to change how electoral votes are granted. Such a system “gives more local control” to the states, he argued. By coincidence, of course, the 2011 Republican-run redistricting process gave the state five Republican seats and three Democratic seats. Had the state divvied up EVs in 2012, Mitt Romney would have won as many electors as Barack Obama despite winning 213,019 fewer votes. (That’s larger* than the total number of votes Romney won in South Dakota.) The “local control” Priebus is talking about here would minimize the votes of urban Democrats, most of them now packed into Milwaukee-centered and Madison-centered districts. So we’ve got five Republican-run states – Michigan, Ohio, Wisconsin, Pennsylvania, Virginia – where an electoral vote split has been discussed in 2013. The fact that Republicans can still use the bogus “local control” argument and not get laughed out of the room is promising for them, if they decide to ram this stuff through. But the Journal-Sentinel also quotes Priebus as saying the idea didn’t come from him. That’s part of the sales pitch; at the same time, it says that Republicans are anticipating the (entirely correct) “power grab” attack. *A mental hiccup lead me to write “larger” and “smaller.” Ironic, when you think about it.